A modern revival of Stoicism is quietly happening. Changing times are making Americans realize that while they can do a lot to improve their lives they can’t visualize and positive think every last thing they want into existence. New books on Stoicism and modern easy to understand translations of ancient works have been fueling this revival. Big surprise, the popular conception of Stoicism is completely wrong. It isn’t about hiding your emotions or fatalism. In fact, many ordinary people are getting into it, because it is making them happier. 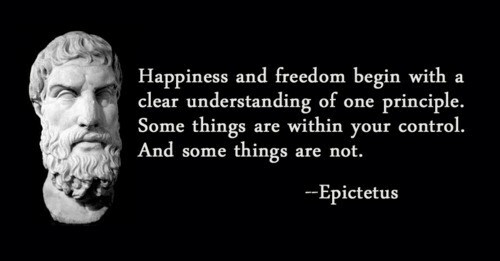 “How To Be A Stoic” by philosophy professor Massimo Pigliucci. The book is written in a very down to Earth, personal tone, and is easy to read. Something else was going on at a time that made me pause and reflect. I have not been a religious person since my teenage years ( I was prompted to leave Catholicism, in part, by reading Bertrand Russell’s famous “Why I Am Not a Christian” in high school), and as such I have been on my own in dealing with question of where my morals and the meaning in my life come from. I take it that an increasing number of people in the United States and across the world find themselves facing a similar conundrum. While sympathetic to the idea that lack of religious affiliation should be just as acceptable a choice in life as any religious one, and strongly supportive of the constitutional separation of church and state in the United Sates and elsewhere, I have also grown increasingly dissatisfied with ( make that downright irritated by) the intolerant anger of the so-called New Atheists, represented by Richard Dawkins and Sam Harris, among others. Although public criticism of religion ( or of any idea) is the staple of a healthy democratic society, people don’t respond very well to being belittled and insulted. There are, of course, alternatives to the New Atheism if you want to pursue a nonreligious approach to life, including secular Buddhism and secular humanism. Yet these two paths — the two major ones on offer for those seeking a meaningful secular existence — are somehow unsatisfactory to me, though for opposite reasons. I find Buddhism’s currently dominant modes a bit too mystical, and its texts opaque and hard to interpret, especial in light of what we know about the world and the human condition from modern science( and despite a number of neurobiological studies that persuasively show the mental benefits of meditation). Secular humanism, which I have embraced for years, suffers from the opposite problem: it is too dependent on science and a modern conception of rationality, with the result that — despite the best efforts of its supporters — it comes across as cold and not the sort of thing you want to bring your kids to on a Sunday morning. Hence, I think, the spectacular lack of success (numerically speaking) of secular humanist organizations. “Men who have made these discoveries before us are not our masters, but our guides. Truth lies open for all; it has not yet been monopolized. And there is plenty of it left even for posterity to discover”. Note: the quote above was hand copied, so any writing errors are mine and not the author’s. The American Library Association maintains a list of The Top 100 Banned Novels Of The 20th Century for your reading pleasure. Please read or talk about a book from one of these lists during Banned Books Week 2017. All freedom and all progress is ultimately rooted in the free flow of ideas.